Lets meet now via GotoMeeting - online support in real time! If you have a software problem and need help in the past if we couldn't help you over the phone we would have to drive over. In alot of cases the issue was major for you, but for us relatively easy to fix and sadly cost you money in terms of a call out fee to cover our time. These days we can offer a faster service and at alot less cost using the power of the internet. Barcode Datalink has a gotomeeting account. If you have a software problem, call us on (02) 9636-5299. Click on the gotomeeting logo below to open the home page. While you are doing that, we will 'Host a Meeting'. Once gotomeeting opens in the new window, click on 'Join a Meeting'. Follow the steps on screen and when ready we will give you a meeting ID to key in. I will make you the presenter and you will show me your screen and give me control. While on the phone you can explain your software problems and I can watch. If we know the solution to the problem we will guide you through it. What is really cool is to combine gotomeeting with Pocket Controller Pro/Enterprise and take control of your mobile computer, wirelessly! Or, I can get my mobile computer running wirelessly on our office network, and bring up the screen in Pocket Controller and you can watch it via gotomeeting on your PC or laptop! 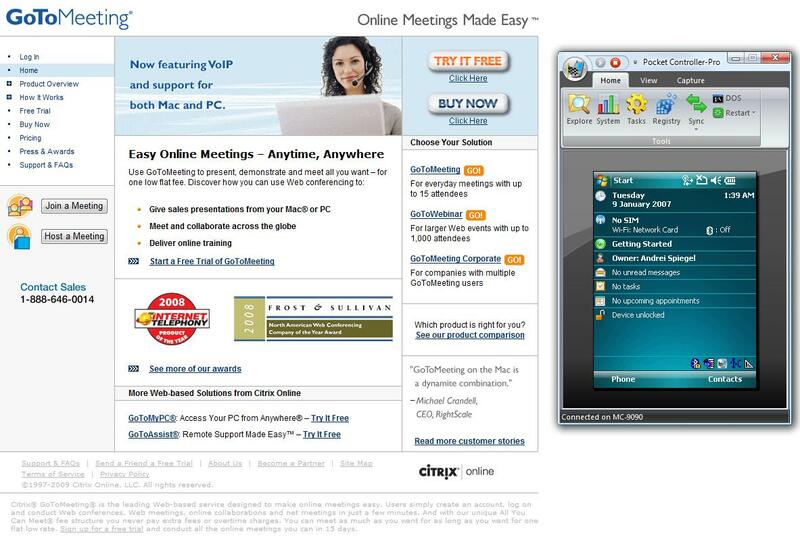 This screen shows you the gotomeeting home page and on the right is what Pocket Controller Pro looks like with the mobile device screen on.